This is a new size of cutting mat in the same easy-use, odorless material as Item 74142 (A5 size) and Item 74144 (A3 half-size). 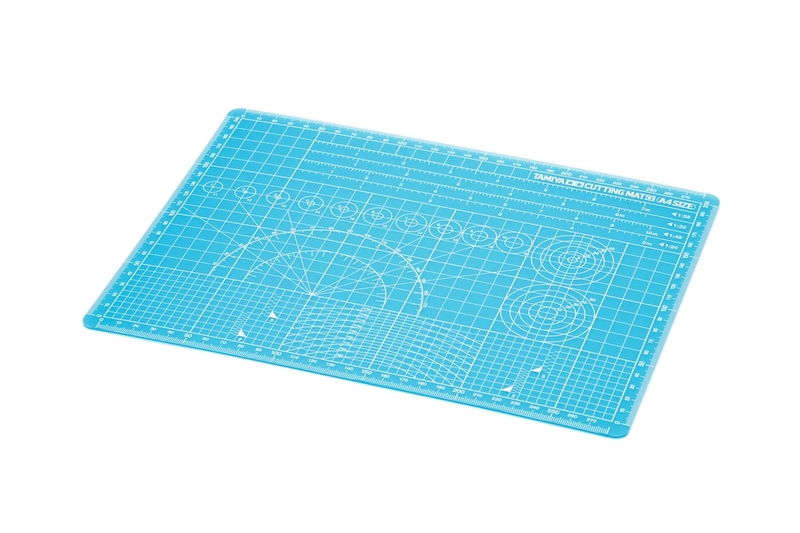 A4 is a happy medium of compactness and workspace, and this mat has an array of useful markings to help with your model making activities! • Dimensions: 220mm x 300mm x 2mm thickness. The surface area slightly exceeds A4 in length and width. • Made from semi-transparent blue-green resin with virtually zero odor. • 3-ply mat features an internal hard layer sandwiched by softer outer layers, increasing knife blade longevity while leaving minimal cut marks. • Markings printed on the front side include: useful grids, increment angles, and curved and circular markings. • Features a scale ruler for easy switching between 1/1, 1/24, 1/32, 1/35 and 1/48, plus handy markings to aid in the cutting out of thin masking tape strips. • Reverse side is left plain.